Designing a geometric grid layout for your website can be extraordinarily beautiful. One of my favorite geometric design element is a hexagon. Hexagons can be used to design well-balanced and harmonious grid layouts (think bee hive). But the design can come with challenges. You have create shapes to serve as backgrounds for your content. Then you have to fit your content inside the shape. Then you have to make sure those shapes are spaced correctly on different screen sizes. But don’t worry. It’s not as hard as you think. As for creating those geometric shapes, there are ways to accomplish this using some advance custom CSS, but I think the simplest way is to create an image. Then you can use the power of Divi for the rest. 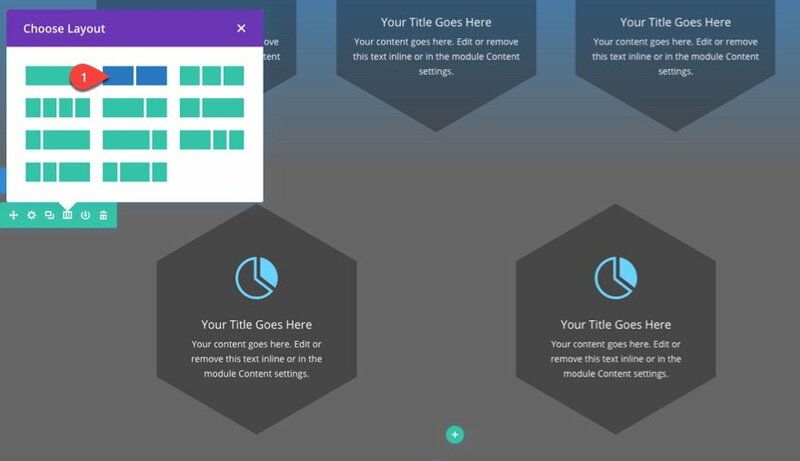 In this tutorial, I’m going to show you how easy it is to create a hexagon shape image to design a geometric grid layout with Divi. Here is a peek at the geometric grid design we will build in this tutorial. 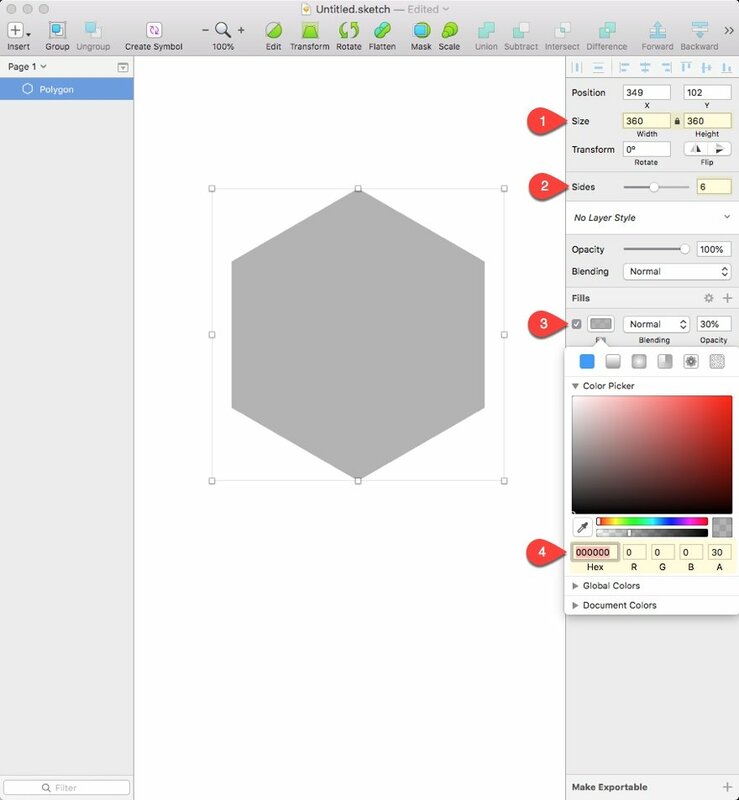 A Photo Editor (I’ll be using Sketch) to create hexagon image. Or for now, you can just drag this image to your desktop and use it. To build the hexagon background image, I’ll be using the photo editor Sketch (for Mac only). However, this should be an easy shape to create on any number of photo editors out there (like Photoshop, Illustrator, or Gimp). If you don’t want to bother with this part of the tutorial, you can always just drag this image to your desktop for now. 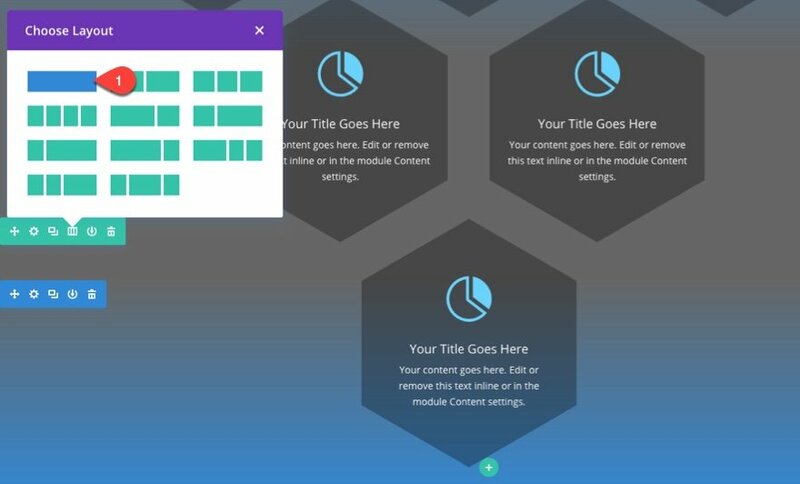 It is a dark semi-transparent hexagon image that should work with a number of designs considering it will allow the background colors behind it to show through. 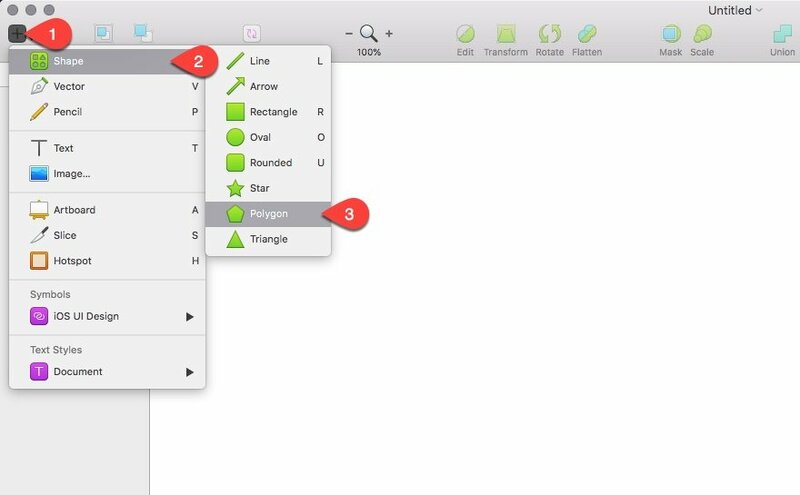 Here is how to create the image in sketch. First, click the insert icon at the top right. Then hover over the shape option and select the hexagon shape. Then export your image as a png and import it to your WordPress Media Library for later. This design will have three sections stack on top of each other, each with a row that holds our differing column structures. The first section will have our three column structure, the second section will have two columns, and the third will have only one column. 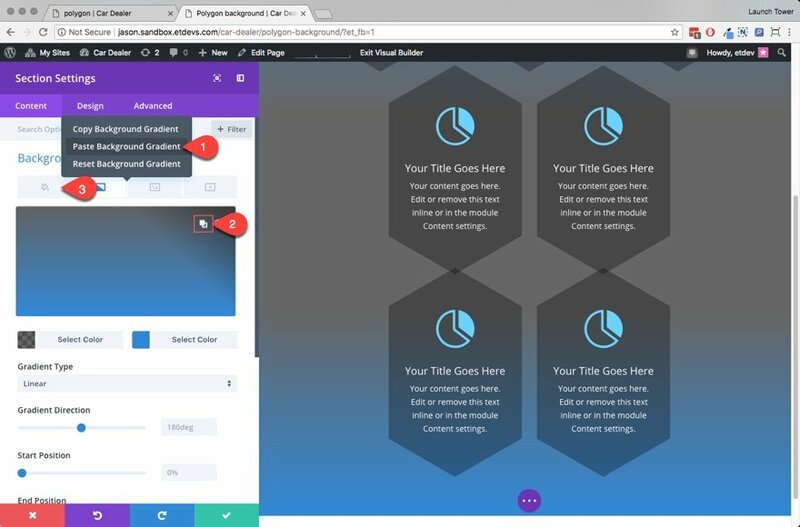 To create the first section, create a new page and deploy the visual builder to build a new layout from scratch. 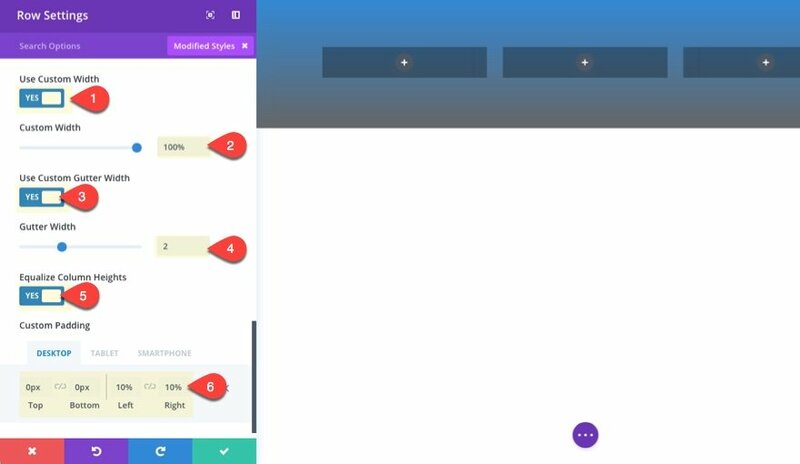 A new regular section will be created for you and the visual builder will prompt you to choose your column structure for your section. Choose the three column structure (one-third one-third one-third). In order to achieve the design we are looking for, we need to add our background image to each column of our three column row. So, for each column, add the hexagon image (should be 360px by 360px) to each column. Then set the background image size to “actual size” and the background image repeat to “no repeat”. Make sure and do this for column 1, 2, and 3 background images. 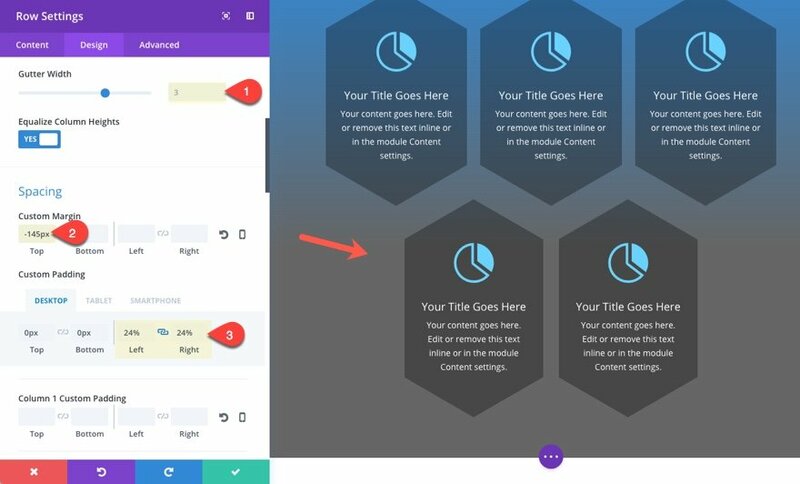 Next we need to customize our row settings to create the spacing we need for our hexagon background images to show correctly in each column. This spacing will also help to keep things responsive and maximize horizontal space on mobile. Save your row settings for now. 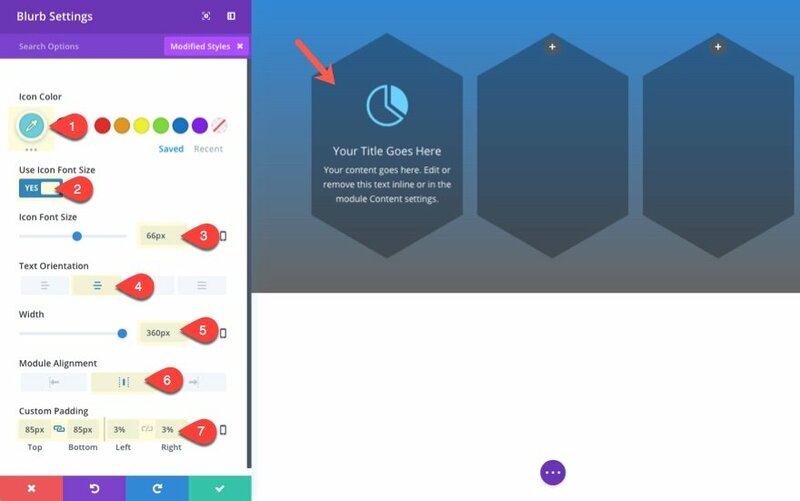 It is important to add the content you want displayed in front of your hexagon first so that you now how to adjust the spacing of your blurb module to reveal the background image fully. Notice I added a top and bottom padding of 85px. This is just enough to expose the hexagon background, even when adjusting the browser to mobile device sizes. After you save out your blurb module, go ahead a copy and paste it to column 2 and 3 so that all three blurbs are present. 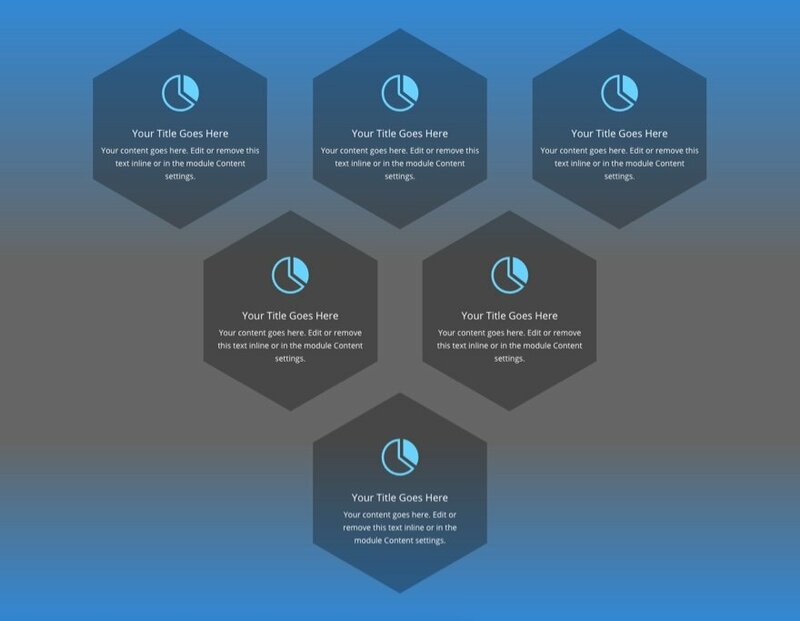 Now we have successfully added hexagon backgrounds to our first row of blurbs. 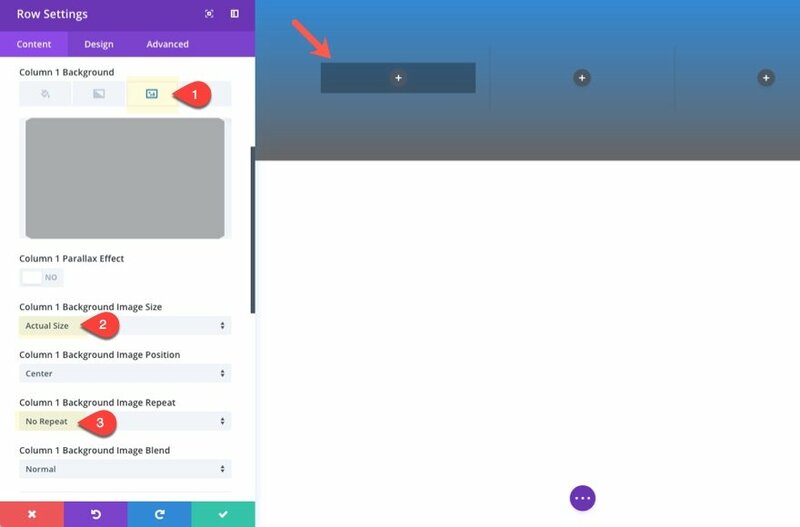 To create our second section, go ahead and duplicate the first section then update the section settings with the following background color: rgba(0,0,0,0.6) and delete the existing gradient. Then Change the column structure of your row to two columns and delete the extra module in the bottom right column. I added more padding to the left and right to position the hexagon backgrounds between the blurbs in the section above (24% padding on each side gets us pretty close). I also changed the gutter width back to 3 to accomodate for the decreased column space due to more row padding. Then I used a -145px margin to pull the row up a bit. As you can see the grid layout is coming together. For the last section, go ahead a duplicate the section section. Then go to the first section and copy the background gradient and paste it to the third section you just created. Then flip the gradients by clicking the “switch” icon when hovering over the gradient color preview. Then delete the background color in the third section. Now update the row column structure to one column and delete the extra blurb module. In order to get hexagon image background to scale with the other blurbs on smaller browser windows, we need to add more padding to the row. This will make the hexagon image squish together a bit to match the others. This is just a small detail to make the design more consistent. Now let’s check out the final result of our geometric grid layout. Here is how it adjusts to different screen sizes. This tutorial shows you how to create a geometric grid by adding a hexagon shape background to your columns, but you can easily apply this same technique to add any background image you want. This opens up a lot of doors for designing beautiful layouts to set your website apart. I hope you find it helpful for your next project, and I look forward to hearing from you in the comments. The post How to Design a Geometric Grid Layout in Divi appeared first on Elegant Themes Blog.